Take a submarine down to the bottom of the sea and encounter beautiful mermaids and pearls. Match 3 treasure chests to unveil an additional bonus game that will earn you 15 free spins to fulfil all of your underwater desires. Looking for more games? Try online slots in the UK! Not everyday do you see an online game developer reach nearly 40 years within the industry, Novomatic has released over 90 titles over the course of its tenure as one of the longest running slot online games developers of all time. For Novomatic it’s all about creating a worthwhile experience for multiple different types of demographics. The ocean amasses over 70% of the earth. Some games like this, however, will take a full 100% of your attention and focus as you navigate the briny in hopes of fishing out some of the lost treasures of the deep with Mermaids Pearl, the online slot by Novomatic. Mermaid’s Pearl comes with 5 reels, 9 paylines and 3 rows. Explore the lost city of Atlantis and earn the treasures of Neptune himself in this pearl of an online slot. To give you a clearer view, we have created a list to find out the worlds best slot games online. 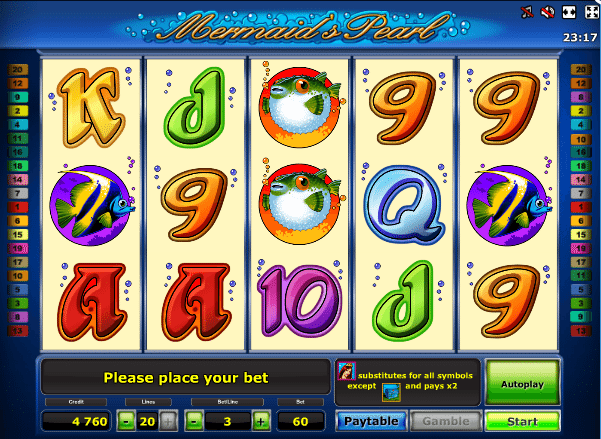 Begin your descent with 15 free spins, or possibly more if you trigger 3 Mermaids on the reels. During the free round, watch out for the 'Black Pearls' because the prize multiplier increases on the next spin for each one that should appear. The game will begin with a 1x multiplier which can go all the way to 10x should you be feeling lucky. If you wish to play with the Clam and Seahorse symbols you must place an actual bet. These symbols offer more chances at an even higher payout. Get 3 or more scattered Clams and you will win 1 pick. Players are awarded a selection of Clams from the top and bottom rows. The ones awarded from the top row can pay you up to 4x your total bet and the bottom row awards you 7x the amount won from top row selections. Select a racing seahorse and win some great prizes as follows: 1st = 100x, 2nd = 80x, 3rd = 40x, 4th = 20x and 5th = 10x. Multipliers are applied the credit bet amount to calculate your win. The Starfish symbol will substitute all symbols except for the scatters, doing this will double your prizes so always keep an eye out for that one. Mermaids Pearl also has a Gamble feature, which gives you the opportunity to once again double your win by guessing one of two choices. The 'Gamble ' will end once you select Take Win, or if you lose the bet. Select the AutoPlay button and the game will spin the reels for you, well at least until the bonus rounds are active, then you could be in for big rewards. All symbols pay left to right except for the Scatters, which pay in any direction. These Scatter wins will be multiplied by the credits wagered per payline. If you liked Mermaids Pearl why not try our Venetian Rose slots game.